This update has long been in the making and it finally makes Gravity Lab what it was meant to be. 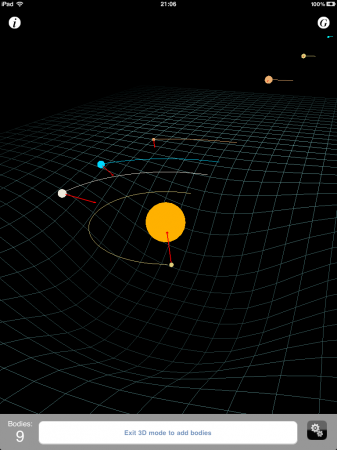 Namely, a gravity simulator with 3D display of gravity potential. Take a look (click for larger image). However, a point must be made for the scientifically inclined: the “gravity well” is not completely accurate due to usability reasons. Let me explain. 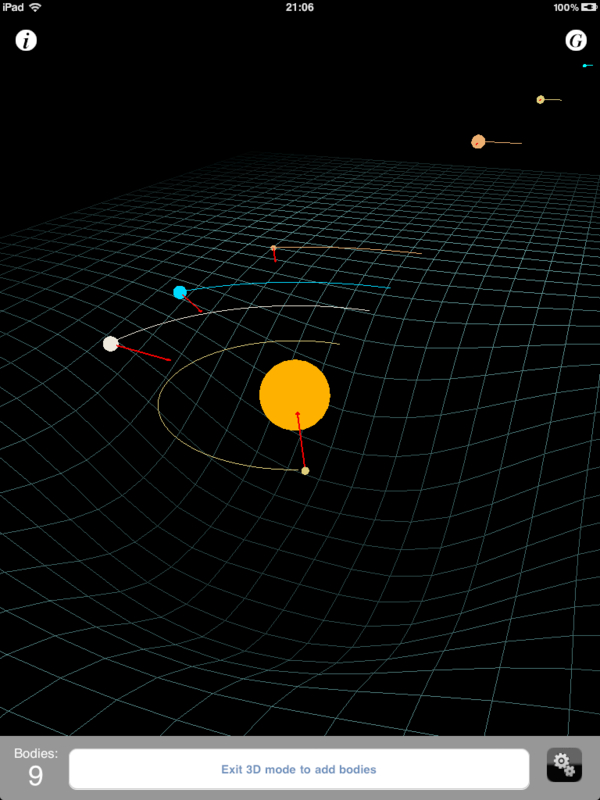 The sizes of the celestial bodies (I’m especially referring to the solar system preset) are not exactly true to scale. You see, if they were you couldn’t see them. The distances involved are so large compared to the sizes of the planets and the Sun, that they’d be sub-pixel-sized (even on iPad3 with retina screen) if the solar system was to fit the screen. You can check their true sizes with an app like Solar Walk (or simply google it). So I had to cheat a little and inflate the planets so we can see them. But this came back to bite me when drawing the mesh. The reason is that the gravity potential obeys different laws inside vs. outside of an object. Namely, outside of an object the gravitational pull is inversly proportional to the square of the distance from the center of mass, while inside the object it changes linearly with the distance from the center. So I had two choices: represent each body basically as a point mass (that would kind of resemble a black hole when zoomed out) which would produce extremely steep wells spiking out of screen and out of sight, or cheat again and try to approximate (smooth) them with a more friendly function. I chose the latter.